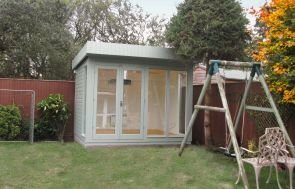 The building measures a bespoke size of 1.7 x 2.4m to fit perfectly in the specified area, which was carefully designed and built by hand with this in mind. 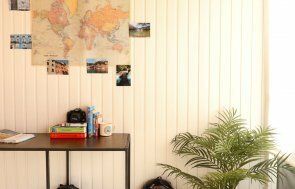 The building has a pent roof covered with our heavy-duty, heat-bonded felt and the exterior is clad with smooth shiplap timber coated in the paint shade of Verdigris, selected by the customer from our vast range of opaque paint shades. The building boasts several floor-to-ceiling windows that are double glazed to ensure warmth throughout the year as well as an abundance of natural light. 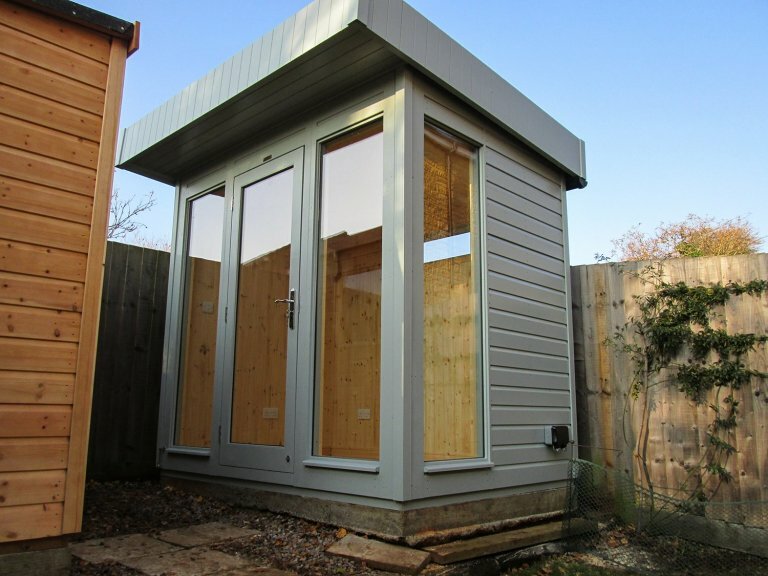 All garden studios come as standard with insulation and pine lining, with our customer here opting to add an electrical pack so that it could be used as a work-from-home office. Our electrical pack consists of interior lighting controlled by a gang light switch, four dual sockets and an external dual socket for outdoor appliances and gardening equipment. They also chose to have a lacquered floor inside the building, which will make it easy to clean and also offer some protection against scuffs and stains. For further choice of colour and increased durability, we also offer the engineered flooring range, which not only has different shades but boasts further sound-absorption and insulating qualities. If you feel inspired by our Salthouse Studio, we suggest that you pay us a visit at your nearest show site, where there will be a building similar to this one on display. At our show sites you can also speak with one of our friendly advisors who can assist with any queries you might have. Locate your nearest one here or contact us on 01760 444229.